Find out what our experts have to say about KTM RC 200! January 19, 2017: The KTM RC 200 is the most track-focused bike you can buy under Rs 2 lakh. It’s got a very committed riding posture, a balanced chassis and a rev-friendly engine. Most of its power is concentrated at the topon the rev band, which means you have to keep the engine on the boil. To accomplish that you have to work the gears quite often, which makes the RC 200 a very engaging bike to ride on a twisty track. On public roads, however, these traits make it a difficult bike to deal with on a daily basis. With the launch of the new 2017 KTM RC 200, it has now become BS IV-compliant to meet the stricter emission regulations. All two-wheelers will need to meet the newer standards by the end of March 2017 to continue sale. The bike also gets new paint scheme for a fresh new look. The KTM RC 200 is the most track-focused machine you can buy under Rs 2.0 lakh. It’s got a super-committed riding posture, a perfectly balanced chassis and a powerful engine. These traits make it a wonderful machine on the track but is a bane in city traffic or while touring. 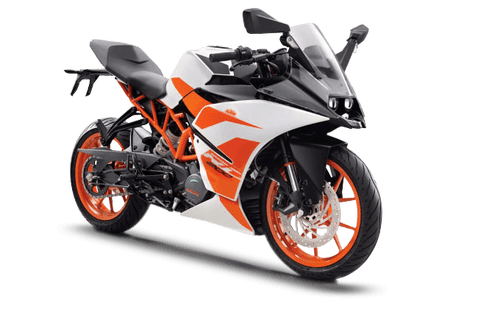 The least priced variant is KTM RC 200 STD priced at Rs. 2,08,561 and the most priced variant is KTM RC 200 ABS priced at Rs. 2,21,207. Choose the KTM RC 200 which fits the bill of you. The RC 200 is the entry level supersports bike offered by KTM. The KTM RC 200 has garnered much praise for its race track skills. There are new updates for the RC 200 but they are subtle, and not as extensive as the RC 390. The bike gets a new white paint scheme with new and attractive graphics. Updates include BSIV compliant engine, redesigned mirrors and seat. The highly capable RC 200 is a good value for money as a fully fairing bike compared to its competitors like Yamaha Fazer 25, TVS Apache RR 310 and the Bajaj RS 200. Currently only two colours are available on the KTM RC 200, one is orange and other is black. The RC 200 is available only in one standard variant which retails at Rs 1.89 lakh (ex-showroom, Mumbai). The new changes for the RC 200 are subtle and bring some relief to the rider. A new white/orange paint scheme with new amazing graphics gives an appealing look and complements the new orange alloy wheels with shorter spokes. The KTM RC 200 sports the twin projector headlamps which perfectly matches with the racing style and supersport look of the bike. To contribute to the perfect aerodynamics, KTM has incorporated blinkers into the mirror structure, which look sporty too. You also now get a good view of the rear road traffic as the mirrors are more bigger and wider. Seat is now more thicker with an extra seat padding of 12mm for the rider and it is much more comfortable giving much respite from the stiff ride. With a complete digital display, the RC 200 has everything you could expect from a state-of-the-art motorcycle, including the current gear indicator, and service reminder light. Just like its elder supersport racing bikes, this has an RPM alert indicator, that shows the best moment for shifting the gear. It also includes a trip meter, an odometer, a fuel gauge, and a clock too. The KTM RC 200 is a compelling yet fun bike to ride. Other than the RC 200’s BSIV compliant motor being more environment friendly, it gets no other change and the free revving unit still performs beautifully. The bike runs on state-of-the-art, liquid cooled, single-cylinder, four-stroke 200cc engine. It provides outstanding power with its twin overhead camshafts, four valves and electronic fuel injection. Thanks to its balancer shaft, the RC 200 now delivers the highest levels of smoothness. The advanced injection technology and the close-ratio 6-speed transmission not only helps the KTM RC 200 to achieve impressive performance, but also extremely low fuel consumption. So, it can reach a top speed of 140 kmph easily and return a mileage of 30 kmpl. The fuel tank of the RC 200 has a 10 litres capacity. KTM RC 200 is a demon at the race track and is equally good on the roads too.The steel trellis frame of the RC 200 keeps the bike rigid but at the same time very light. Suspension on front of the bike is handled by 43mm WP upside-down telescopic suspension with 125 mm of travel and at the rear by WP monoshock suspension with 150 mm of travel. With the stiffly sprung suspension the bike corners amazing on bends. The tyres used are MRF and does not inspire confidence as the sticky Metzeler ones. Hence, if you lean in too hard the tyre might slip and give away. Also, If you lean in very aggressively it scrapes on footpeg corners as well. Braking on the RC 200 is handled by a 300mm four-piston radial fixed calliper disc at the front and a 230mm single-piston floating calliper disc at the rear. Combined with advanced control of the bike, the clip on handlebars and switches on the RC 200 contribute to a sporty and aggressive riding position. Now with the BSIV update, the KTM RC 200 gets Always Headlight On (AHO) feature which increases the visibility in any weather conditions. Braking is now safer on this high speed monster as it is equipped with front and rear disc brakes. Inclusion of an Anti-lock Braking System (ABS) in this bike would have increased the safety for the rider.